The Chinglish Files by olr: Postal code 00. The slightly boastful (and often rather uninformative) way of Chinese museum education seen at its best. 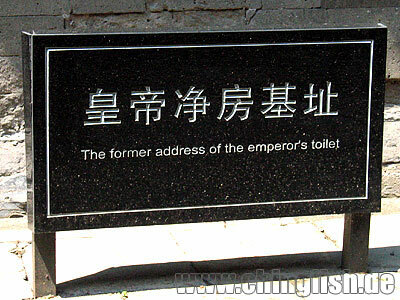 My suggestion: The former site of the emperor's washing room (I assume that he had a separate change room). Taken at the imperial summer palace in Chengde. Many thanks, Patricia! well,man, I am a Chinese, and I believe it is a good thing if some westerners to improve their translation works.Problem is, there are thousands of mistakes we can found, but some are related to Chinese language logic, some are related to translater's errors. How to distinguish them? P.s. : that's the topic of my dissertation. Cheers. I assume that he had a separate change room -->您眞內行! you might have watched the Chinese soap drama. Last week I went to a local managed western restaurant and stucked with its menu. 意萨客 (name of the restaurant) being translated to Italia Sa Guest. 铁板西冷牛排：Iron plate West Cold Cow Rib. 铁板沙朗牛排：Iron plate Sand Bright Cow Rib. Whole menu with this kind of translation. If this is purposely translated, well it's good, they really made me laugh (good health). Chinese toilet did not use water and soap. You may have not see traditional chinese style toilet. Would be nice of this sign to let me know just that :).